Departed Melbourne just after midnight on a cold, windy night. Excited by the prospect of escape from the long cold winter and for the chance to restore the soul with a serious dose of vitamin D! Our flight aboard Singapore Airlines A380 was very comfortable. Staff friendly. Managed to get a few hours sleep on 8 hour flight. For those traveling in economy class who prefer extra leg room you can now pre-book online preferred seating like exit rows before departure for an additional payment of approx. $ 50.00 per sector. On arrival at Singapore Changi International Airport we headed straight for the Ambassador Transit Lounge located in the centre of the shops on the first floor of transit terminal. If you have a long stopover at Singapore airport and don’t have lounge access I recommend you use the service of the Ambassador Transit Lounge or Hotel. You can have a shower and freshen up for just 8SGD or have 5 hours lounge access for 35SGD. If you prefer you may book a double hotel room for a minimum 6-hour block for around 92 SGD. Theses facilities can be found in all three terminals. After a lovely refreshing shower, some food and drink, attending to some emails and messages our 3.5 hour transit time had disappeared. It was time to jump on the Skytrain for the short transfer to terminal 2 where we would depart for our flight to Male, Maldives. A comfortable 4.5 hours flying, a few movies and a meal and we were being greeted by warmth and brilliant sunshine of another beautiful day in Male. HANDY TRAVEL TIP NO 3. At Singapore airport have a change of clothes in your hand luggage more suitable for 30 degrees and sunny. Customs and baggage collection is a quick and easy process. Out the doors and you are greeted with a sea of people holding name boards for their resorts. It is a bit overwhelming at first but then we manage to hone in on the board for Dusit Thani Maldives Resort. We wave and the smiling face is relieved to find us. We are whisked away with our luggage to the Maldivian Air Taxi check in. Everything is quickly weighed and tagged and we are whisked away again. Male International is a huge open air tin shed. If you are staying on one of the islands close to Male you will go straight to the boat jetty which is alongside the airport to be transferred by speedboat or launch to your island resort. Alternatively other resorts are only accessible by seaplane. You will then be transferred by minivan to the other side of the airport where the seaplanes depart from. VIP lounges are provided by many of the 5 star resorts at this location. We then enjoyed a spectacular 40-minute seaplane flight from Male to Mudhdhoo Island in the BAA ATOLL, home of the Dusit Thani Maldives Resort. Truly breath-taking sight from the air. We circle and land softly on the water in front of the beautiful island which will be our home for the next 6 nights. 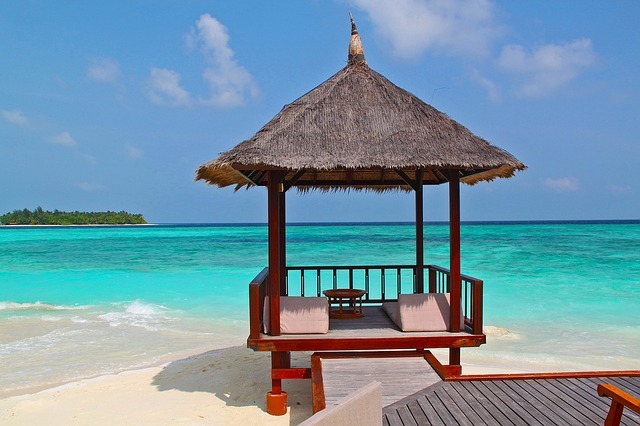 The Maldives is made up of approximately 1,190 islands, spread over 20 atolls, with Faroese or ring-like coral formations enclosing lagoons in the Indian Ocean. The Maldives stretch about 820 Kms from north to south, 130kms at the widest point and a maximum altitude of 2.3 metres above sea level. The Maldives are located just south of Sri Lanka and India. Today there is a population of approx. 300,000 people living on approx. 200 inhabited islands. As many as 100,000 live in the capital of Male. The main industry is tourism with over 100 island resorts. Fishing is still the mainstay of traditional island life. The coral reefs of the Maldives are some of the most spectacular in the world. The crystal clear waters and warm climate make diving and snorkeling conditions perfect. The Maldivian government has a strong policy for protection of their coral reefs, the endangered turtle population and all marine creatures. BAA ATOLL is the only atoll in the Maldives to be given the distinction of World Biosphere Reserve by UNESCO. Dusit Thani Maldives located on Mudhdhoo Island in the BAA ATOLL is seriously committed to creating sustainable tourism. To minimise the resorts affect on their environment they have developed many green initiatives which are listed under the resort description below. From the minute you land on the main jetty at the island you are greeted with a wonderful warmth that makes you feel like you are being met by old friends. The manager and staff greeted us then we were whisked away by our private butler who escorted us to a golf cart and transported us through the island to our own private beach villa. He completed our check in our room, answered our questions and left us to relax and freshen up before dinner. Perfect! DUSIT THANI MALDIVES is located on a unique jungle island in the BAA ATOLL which is completed surrounded by a stunning 360 degrees coral reef and the most stunning aquamarine lagoon. this island is a snorkellers heaven. The second day after a wonderful sleep in our very comfortable king size bed we headed to the Market restaurant for an amazing buffet breakfast. Fortified with incredible fresh fruits, a wonderful omlette and tea we headed to the watersports centre to get kitted out with our snorkels, masks and flippers for our stay. Back to our villa we headed straight out from our beach to see what this house reef had to offer. We were not disappointed – it was stunning. The corals are brilliant, the abundance of fish incredible and we were only out there for 10 minutes when a turtle just cruised on by. This was very exciting. I am a big turtle fan! In the afternoon we treated ourselves to a Devarana Signature Massage at The Devarana Spa. What a treat it was! Nestled in the treetops amongst the palms we received a very relaxing Thai massage easing away the last of the stresses of travel and home. In the evening we enjoyed a sunset drink at the Sala Bar which was most spectacular before heading downstairs to Dusit Thani’s signature Thai restaurant Benjarong. A beautiful meal on the deck overlooking the ocean. A perfect end to the perfect day.